Viral Outbreak, Synthesizer Sample from Nucleus Soundlab. 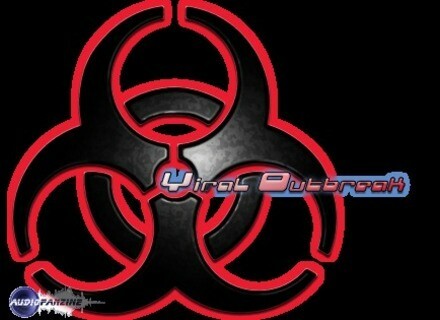 Nucleus SoundLab has updated Viral Outbreak VSTi to v1.5. GrooveBox step-sequencer component now added and integrated into VSTi. With this component you can sequence entire tracks inside Viral Outbreak. FX .dll added to package. This can be used to add Viral Outbreak as a VST effect to your tracks. 136 brand-new presets by Tasmodia and Jeremy Janzen. Most focus on complex GrooveBox sequences. Additionally, 44 of these presets have been added to the Favorites folder. HQ Selector for each layer. When selected, it will oversample 4 times the current layer. This option is saved per preset and also in the project/song. New Modulation-Matrix Destinations: All Envelopes Attack, Decay, Sustain and Release levels (All Amp and Mod Envelopes). New Modulation-Matrix option: Real-Time (ON by Default). When you have a Mod-Matrix slot that doesn't need to be processed in Real-Time, you can turn this option to Off and save a lot of CPU usage. The processing will only be done when a new note is played. Several new options to the WusikSND format as described by the list below (plus support for the same options on SFZ files). Added all the above new WusikSND options to the new Integrated Sampler-Editor. Disk-Streaming support for SFZ/WAV files (16 and 24 bits - Layers O1, O2, O3 and O4). More SFZ op-codes: PITCH_KEYTRACK=0, PITCH_KEYTRACK=100, LOOP_MODE=ONE_SHOT, LOOP_START, LOOP_END, OSCILLATOR=ON, TRIGGER=FIRST, TRIGGER=LEGATO, TRIGGER=RELEASE, OFFSET, SEQ_POSITION, (aka Round Robin, starts at 1) SW_LAST, SW_DOWN, SW_UP, SW_PREVIOUS, (Key Switches, -1=Default and -2=SustainPedal) LORAND and HIRAND (random sample selection on new note). SFZ Export added to the sample-editor. New Choke-Group: Stop All. When playing a sound with this group setting, all other notes will stop. In the SFZ support, this is group 999. Drag-and-drop of WusikPRST (Preset) files (before it was WAV, WusikSND and SFZ files only). New Skin-Type 003. All Mod-Matrix parameters are hidden in the following layers: Master Mix, Master FX Edit and Wavesequencer Editor. When trying to load a WusikSND file that is missing, first, the code will try to open the same file-name with the .SFZ extension. If a SFZ file is found at the same location as the original WusikSND file, it gets loaded and the preset re-saved with the SFZ reference instead. Skin updated so arpeggiator is accessible. Several problems related to reading WAV/SFZ files. Problem with the FX version related to some graphic-images. Problem with Loop-Position Modulation x Poly Presets. Groove-Box/G-Seq Problem when using Note-Learn muting the note inputs. Groove-Box/G-Seq Midi-Learn is now working on all Groove Box parameters. Internal memory leak problems with very large sound files. Changing number-of-voices no longer re-loads sounds, only the preset. This update is free for all existing owners of Viral Outbreak. Expert Sleepers Augustus Loop Update Expert Sleepers has updated the AU version of Augustus Loop to v2.0.3.